Owen James practices commercial litigation. He has a particular focus on complex corporate-commercial litigation, environmental litigation, real estate litigation and insolvency litigation. He has appeared as counsel at the trial and appellate levels, including at the Supreme Court of Canada, and has also acted for clients in arbitration and before a variety of administrative tribunals. Prior to practice, Owen served as a judicial law clerk to several justices of the British Columbia Supreme Court. 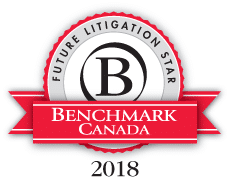 Owen regularly contributes to the Continuing Legal Education Society and has written for the Annual Review of Law and Practice and Provincial Court Small Claims Handbook, on which he serves on the Editorial Board. He has written on a range of topics for The International Who’s Who of Insolvency & Restructuring Lawyers, CCH Tax Topics, Canadian Property Management and Annual Review of Insolvency Law, and has also presented on topics relating to his practice. Succeeded in defence of a forestry company in administrative proceedings under the Forest range and Practices Act. Succeeded in appeal before the Supreme Court of Canada for a secured lender in a case involving priority of unremitted GST proceeds in a failed restructuring under the Companies’ Creditors Arrangement Act. Succeeded in defence of an employer in respect of a claim for wrongful dismissal brought by a former employee. Succeeded in defence of a lottery retailer charged under the Gaming Control Act. Succeeded in defence of an individual in a forfeiture application in respect of property under the Criminal Code. Succeeded at trial and on the subsequent appeal for a plaintiff in an action for damages in nuisance against the City of Vancouver. Succeeded at trial and on the subsequent appeal for a defendant airline in certification proceedings under the Class Proceedings Act.